The Pirates squeaked out a win last night in San Francisco, 6-5. Garrett Jones hit the go-ahead single in the 8th ininng after an inexcusable error by Giants shortstop Edgar Renteria. The Bucs are back to playing .500 ball. Jones wasn't the only one who played a good game. 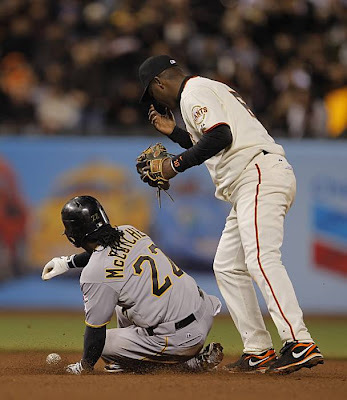 Aki Iwamura and Andy LaRoche homered (welcome to the '10 season Andy) and Andrew McCutchen had two more stolen bases. There was a few web gems in this one as well. Staring pitcher Paul Maholm flipped the ball from his glove to Matt Clement for an out and Jones had a diving catch at first for the final out of the game. Evan Meek got the win, pitching two solid inning and striking out three. Octavio Dotel got the save, although doing it in Matt Capps fashion. The rubber match is today at 3:45. Go Bucs!